Later on, upon her mother’s recommendation, she applied to and was accepted to Parsons School of Design in the West Village, and it was there that she made the final decision to focus on millinery. Burris was inspired by the craft after studying abroad at Parsons Paris where she reveled in the beauty of the vintage millinery shops. When she returned to New York, she enrolled in a small millinery class in Parsons, and that was, as they say, that. 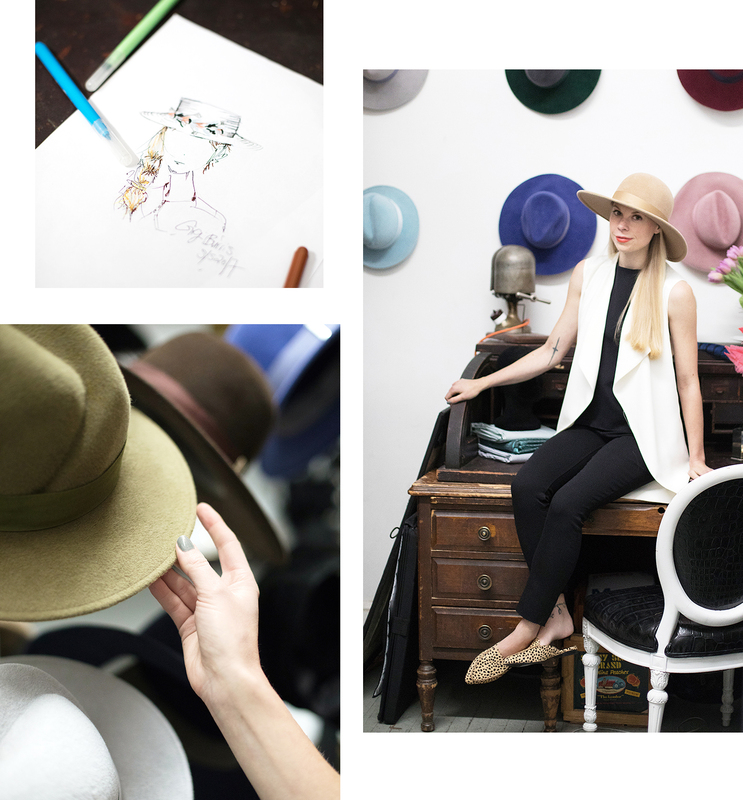 RAD HATTER: Burris’s studio is literally filled to the brim with hats of all shapes, sizes, and styles. Her vintage desk might just be the only thing that’s not a hat. Burris wears: Express vest, denim, and mules. Top and hat, her own. “More than any other thing, more than jewelry, more than shoes, more than a handbag, this is something that people are going to comment on. [Hats] are on your face. They’re really visible,” says Burris. 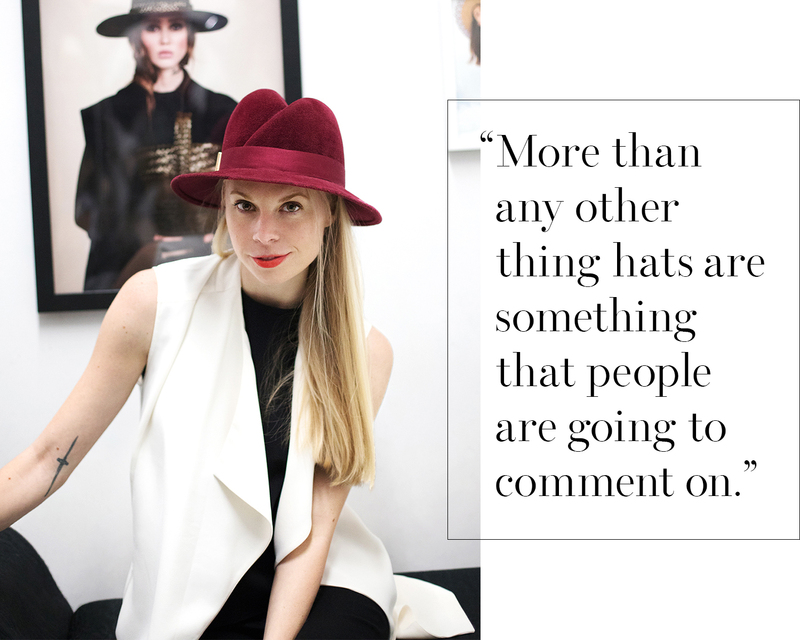 “It is such a transformative accessory.” In a world where hats have become a purely seasonal accessory—who’s matching their pillbox to their tweed suits anymore?—or an accessory worn to royal weddings, Burris is bringing beautiful handmade hats back to mainstream fashion. In fact, the designs from her senior thesis project were so good, they ended up on Rihanna in W magazine shoot shortly after she graduated in 2009. After that major milestone, Burris entered the real world, working on freelance design and styling projects, and designing exotic skin and fur accessories for Dennis Basso. All the while, she was slowly beginning to develop her business by loaning handmade pieces for shoots, a move that led to private clients and catching the eye of wholesale boutiques. TOP OF THE LINE: Burris’s studio is located in one of NYC’s classic old Chinatown warehouse buildings. The original industrial elevator takes you to the roof which has views of the Empire State Building. Burris wears: Express top, pants, and shoes. Woven beret and earrings, her own. DETAILS, DETAILS: Working cheeky accessories (or cute detailing) into your existing wardrobe is as easy as 1, 2, hat! Burris wears: Express top. Jacket, skirt, and hat, her own.